Mobile Apps & Landing Pages in a Jiffy, No Code Required! Depending on your business you don’t need to spend weeks building the sleekest mobile apps for native environments, sometimes something a little quicker and simpler will suffice. Enter two new offerings: Firstly, from the team behind ClickTurn ads comes WidgetBox Mobile, which seeks to help businesses build mobile web apps in minutes and secondly, the Mobile Landing Page Creator recently released by Google as an add-on to the existing Google Sites platform. Build and Deploy Mobile Web Apps for iPhone and Android in Minutes. Widgetbox offers a web-based do-it-yourself platform that will allow you to build HTML5 powered apps. Through the WidgetBox client you can build and customize your app with images, icons, skins, add social media buttons and streams, create a splash page, change fonts and include special features including slideshows and interactive polls. “Widgetbox’s Engagement Platform helps us both win new business and reduce the cost, time, and complexity associated with deploying highly-engaging applications,” said Ekapat Chareonlarp, director of program development at IDG Communications. Mobile App Builder: make a mobile web app in minutes without writing any code; create a custom app for a fraction of the cost and time of traditional native apps. Cross-Platform Functionality: create a mobile web app that works on both iPhone and Android devices. Widespread Distribution: distribute the app through multiple channels including social media, email, text (SMS), quick response (QR) codes, and your own website. No need for complex and lengthy app store approvals—just quick and easy distribution on the customer’s own terms. Ripple Live Updates ™: edit an app anytime, any place and push live updates through the cloud-based online service. Advanced, Detailed Analytics: detailed insight into how the app is performing to allow customers to continually optimize performance. Some obvious advantages to using a self-service platform like Widgetbox Mobile include no waiting for app store approval and the ability to instantly deploy application updates. A potential drawback for some folks is the fact that for the sake of efficiency and convenience, you’ll have to forego the richness often found in native, more costly mobile apps and the deep sense of customization available with building something from scratch. That said, the default output and customization options are sufficiently engaging and cosmetically appealing for most small businesses looking to dip their toes into the mobile application development pool. Beyond Widgetbox Mobile, the marketplace for services that quickly help users build mobile apps is certainly growing — Some of Widgetbox’s competitors include similar offerings such as Mobify, which pulls elements from your existing website, iBuildApps and appMobi, which caters to the iPhone and Android platforms. Select the types of pages to add to your application & populate using your RSS feed data and social profiles. Enter your application information including, logos, themes, startup images etc. Preview your new application and tweak as needed or publish the changes. Choose your distribution options and package, or continue using the free trial – your app will be available for testing for 14 days. Share the application URL with friends, family, and customers – amaze everyone! Grab your coffee and head back to your desk to await the kudos which are sure to follow. Google also recently released a tool which allows the less programming-inclined people to build professional mobile web pages for FREE. The age old problem of mobile landing pages costing a fortune and being complicated are coming to an end. Users who are making use of Google sites will be glad to know that their sites are are already optimized for mobile by Google. So, if you’re already a Google Sites user, the landing pages make a nice addition to your current user engagement arsenal. 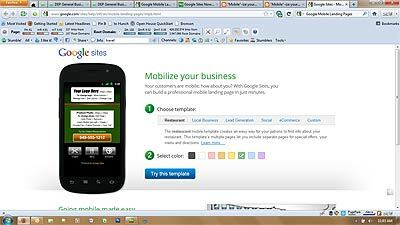 If your company, like most others is not using Google Sites to create mobile friendly sites, but still wish to run mobile campaigns the Google Mobile Landing Page creator is sure to be a useful tool for directing users to mobile landing pages which offer features such as click to call functionality as well as full integration with your existing analytics tools of choice. Select a template. Google has several options for you to choose from. Select a color scheme which is appropriate for your brand. Update the template. Add your logo, product photos, ad text, your phone number and address. Your mobile landing page includes click to call functionality as well as a map. Select a name for your mobile landing page and set up the destination URL. *Hint – make the destination URL easy to remember for quick and easy future reference. WidgetBox Mobile Vs. Google Mobile Landing Pages – Which one is right for you? In closing it’s clear that these two services are slightly different and aimed at achieving different objectives. If you simply need mobile landing pages for your campaigns, then the Google Mobile Landing Page Builder is a great tool for you to try. It’s still advisable to clean up your sites mobile rendering to ensure the best user experience possible if your landing page offers users access to other parts of your website. The addition of mobile landing pages to your campaigns also has a positive impact on your AdWords Quality Score. If you’re more interested in offering a simple or full-blown mobile application to interact with prospective clients via their mobile devices, then the WidgetBox Mobile Application Builder represents the quickest, easiest and cheapest route to market. This is especially easy is you already have product feeds which can be plugged directly into WidgetBox for rendering. Should you be driving users to other parts of your website from the either the mobile app or landing page, or offering shopping functionality it’s still advisable to spend some time on getting your site’s mobile rendering sorted out to minimize the disconnect when users move from the mobile app into your site to interact with its content. So, armed with enough caffeine and time, there’s no reason you cannot begin to leverage the power of mobile to interact with a huge amount of potential customers which exist this week! Please feel free to highlight your experiences and show off your creations by leaving us a comment below, we’d love to see your creations.